Visit our Poodle names page. 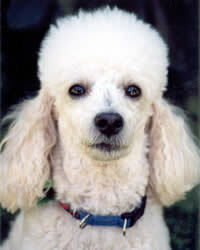 The poodle dog breed is very intelligent, attentive and highly intuitive. There are three varieties, including the Standard, Miniature and Toy, but the Standard is the oldest of the three. They are full of life and their enthusiasm is addictive. This breed was favored both by royalty and gypsies as well. The Poodle breed originated in Germany but was later developed in France. Its place of origination is still a subject of much debate. Some say it originated in Germany, while others point towards Russia. Today the breed’s origin is said to be French. In its early days this breed was used as a water-hunting dog as well as a military dog, guard dog, and even a circus performer. As these dogs because more popular they served as an elegant companion for wealthy and fashionable ladies. This breed was registered with the AKC in 1887. The Poodle breed is a very popular family dog and is extremely intelligent and easy to train. It is always eager to please and is a very sociable animal that is always full of energy. These social dogs thrive in an environment where there is constant human companionship and they are very good around children. Mental and physical stimulation are very important in order to keep this breed happy. Surprisingly, they make very good watchdogs as they are very protective of their loved ones. If you are going to be constantly away due to work or other personal business, you may want to consider another dog breed. their family as much as possible. Grooming – Poodle dogs have a very dense and harsh coat that is either curly or corded. Regular grooming is a must to ensure that their hair remains matt-free. Clipping should be done every six to eight weeks. Ears must be kept clean and dry to prevent infection. Diet & Exercise – Since this is a very energetic dog, you need to provide them with both mental and physical exercise to keep them fit. The best scenario is to walk them every day and to provide challenging play sessions as well, including swimming when possible. They will love it. They really like romping and running, but you must be careful to find or provide a safe area for their activities. epilepsy, cataracts and Addison’s disease. Poodles are very intelligent dogs, making dog training pretty easy. Harsh language or training methods do not work well with this breed as they are very sensitive. For the best results, use positive dog training methods, being patient, firm and consistent during the training sessions. If you love dog tricks, this is the breed for you. Their high intelligence makes them very good at learning tricks and they can be very entertaining for you, your family and anyone else who wanders by. Have fun!